"Reminiscence of Zhou Ya Fu 周亚夫之风 (zhōu yǎ fū zhī fēng)"
One of the 5 most important generals to Cao Cao 曹操, Xu Huang is a man of righteousness. He first came to Cao Cao's attention as a general of Yang Feng 杨奉, an enemy leader that Cao Cao intends to vanquish. Seeing Xu Huang's strong combat ability, he convinces Xu Huang to join him. Xu Huang agrees to defect, but refused the request to murder Yang Feng, exclaiming that he would not do such a dishonorable deed. Xu Huang then became fast friends with Guan Yu 关羽 in the short period that Guan Yu was with Cao Cao, but when they eventually stood on opposite sides of the battle field, Xu Huang made clear to Guan Yu that his duty was kill him and cannot let personal ties get in the way. Such integrity and responsibility was highly appreciated by Cao Cao, who likened him to Zhou Ya Fu. 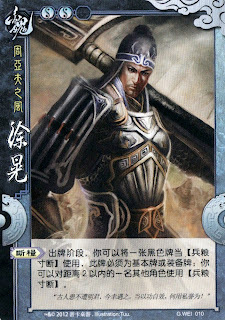 Character ability: "Blockade 断粮 (duàn liáng)"
You can use a black-suited basic card or equipment card as RATIONS DEPLETED 兵粮寸断. You can use RATIONS DEPLETED on other players within the physical distance of 2. In the story, Xu Huang carried out raids to sever enemy supplies a number of times. The most notable was his raid on Yuan Shao 袁绍's supplies during the battle at Guan Du 官渡之战, which sealed Yuan Shao's defeat. Years later, Xu Huang effectively carried out a blockade during his battle at Fan Cheng 樊城之战 against Guan Yu. He instructed his troops to surround the nearby city of Yan Cheng 偃城 with trenches. The enemy troops at Yan Cheng, thinking that their supplies have been cut off, abandoned their position and gave Xu Huang a strong foothold from which to attack Guan Yu. What the troops of Yan Cheng did not know was that the blockade was a fake, as Xu Huang's troops were too green for outright battle at that point.